Probably one immediate question about this page is - why does it list both No.164 & No.166 together? 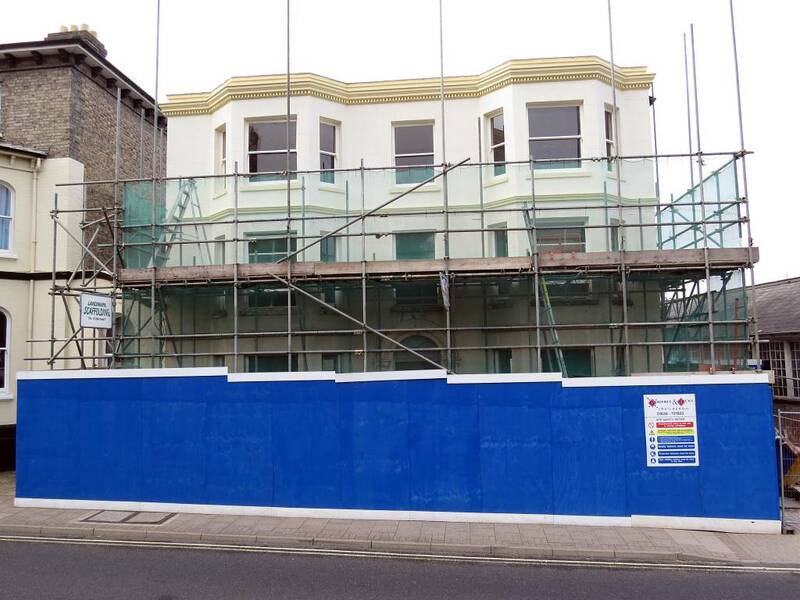 - the two sets of houses on the High Street appear to be completely independent, each having its own identity. 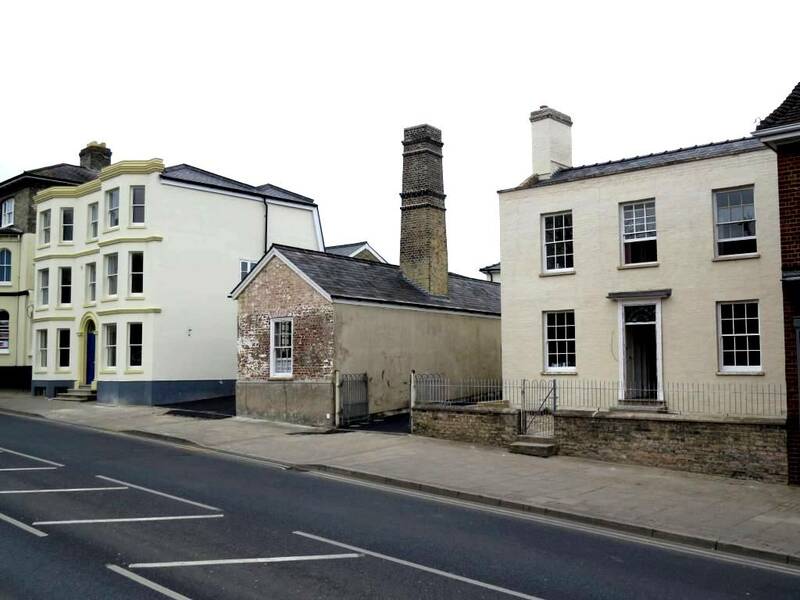 Even just recently the two houses facing onto the High Street were clearly still part of a common estate; as they were both refurbished at the same time. What's actually more relevant here is that if we refer all the way back to the Newmarket historian Peter May's investigation of the history of Newmarket over 500 years ago, both these houses are located on the same burgage plot - an historic segregation of property that produces almost identical width plots of land that front onto a main road. Referring to Peter's map of 1472 this site was plot No.3 and it extended all the way back to the present-day Fitzroy Street (details of the occupiers at that time are shown in the history list above). The picture above left is an extract from John Chapman's 1768 map of Newmarket and shows that at that time Burgage plot No.3 was mostly just hedged-in pasture, with just a couple of small areas of cultivated land plus a few buildings up against the High Street. The picture above right is from a 1901 map of Newmarket and shows that the buildings that are present today on this plot of land had been built by that time. The unnamed building in the centre on the High Street is shown as a Smithy (Smy) - i.e. blacksmiths. 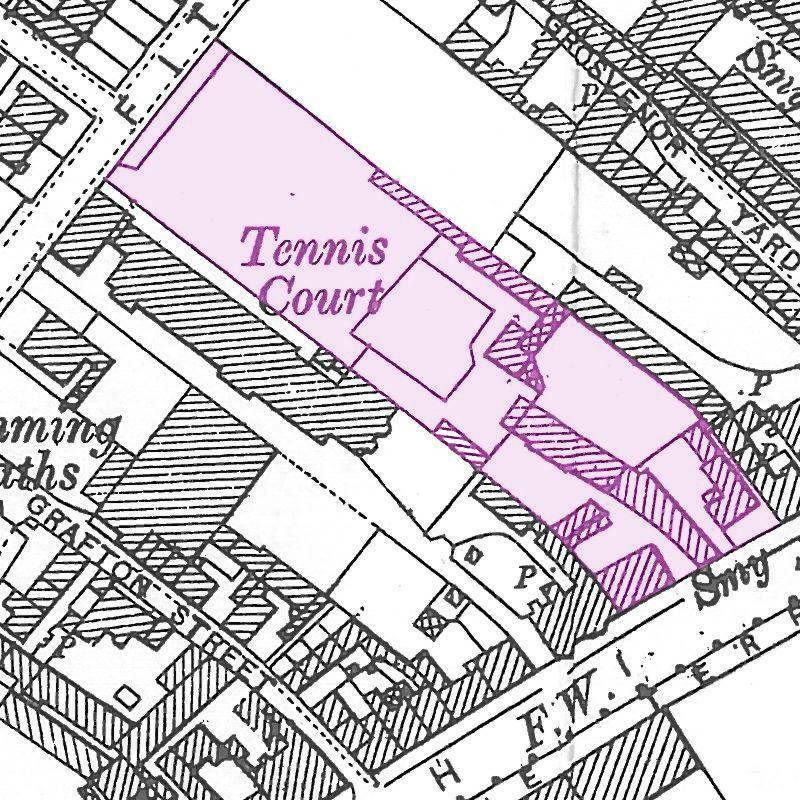 The title Tennis Court refers to the Real Tennis court building in the adjacent plot of land that at one time was owned by Crisswell's Garage - No.170-176 High Street. 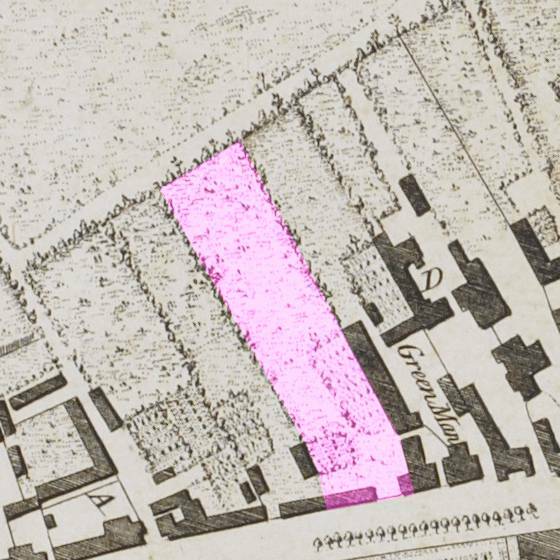 The 1821 enclosure map of the northern part of Newmarket (not shown above) shows that these two buildings and the forge were present even at that time. 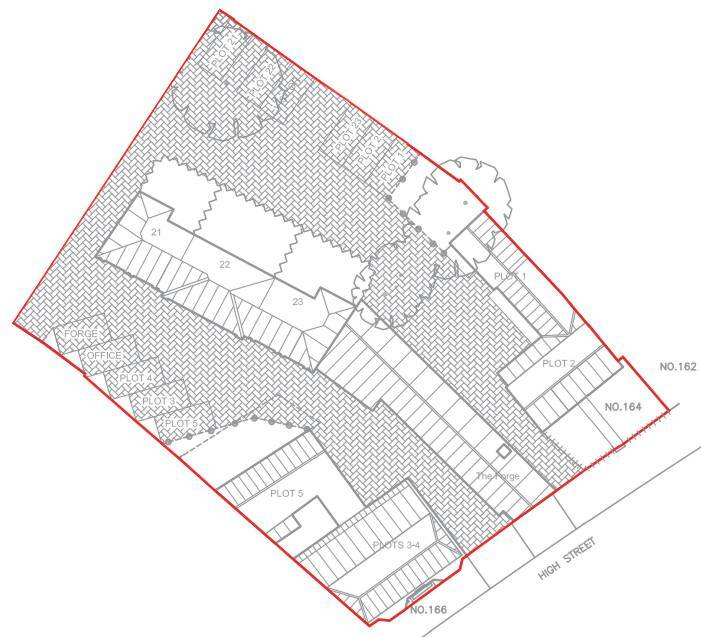 Located centrally in this plot the forge is significant in that to this day it has retained a large amount of surviving historic structure. The building only ceased being used as a farriers in the early 1990’s. As can be seen below it contains a massive brick chimney with four arches and freestanding hearths. 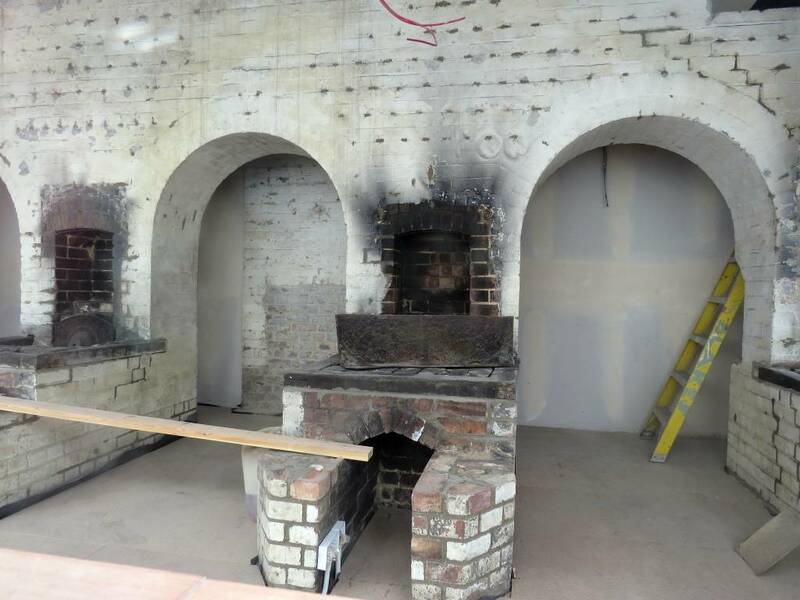 Many of the internal surfaces are heavily sooted, and at the commencement of the recent refurbishment all the paraphernalia associated with forging, including nails to hang horseshoes, bellows, workbench and other equipment were still present. Until just recently No.164-166 High Street had been the site of the Equine Vets Centre, which in 2008 transferred to the Newmarket Equine Hospital, now sited at the Stetchworth Toll roundabout, near the July Racecourse. This present-day extensive veterinary practice has a history on the site here that extends back to the early 1800s. Richard Barrow was born in Newmarket and baptised at St Mary's on 14th October 1817. His parents were William and Mary Barrow. He married Elizabeth Neal in 1841. Their son Frank Arthur Barrow went on to own the pharmacy at No.22-24 High Street from around 1881. Richard qualified from the Royal Veterinary College on 14th June 1837. He lived at this location until sometime after 1861 and then in 1871 can be found living as a farmer at Dullingham, as a widower, with one of his sons and two daughters. He was listed as both a farmer and still a veterinary surgeon. Richard died in Dullingham and was buried at Dullingham St Mary on 31st march 1879, aged 62. Richard's older brother William was baptised at Newmarket St Mary's on 30th August 1816. He qualified from the Royal Veterinary College two weeks earlier than his brother on 28th May 1837. William married the daughter of Richard Dixon Boyce - Caroline Frances Boyce, who was born in Newmarket and baptised at All Saints on 11th May 1815. They married at Woodditton St Mary on 20th February 1838 and William took on the name William Boyce Barrow. There are some points of significance here - a Joseph Rogers is detailed in William's father's will below - though this is probably a few generations previous to the Joseph Rogers who's name became significant with the Boyce & Rogers saddlers business at No.112-114 High Street - clearly there's some familial links becoming apparent at this time. Mr. William Boyce Barrow, of Newmarket has been admitted a member of the Royal College of Veterinary Surgeons, and received his certificate to practice. As can be seen below William became a volunteer in the 1st Huntingdonshire Light Horse Volunteer Corps. 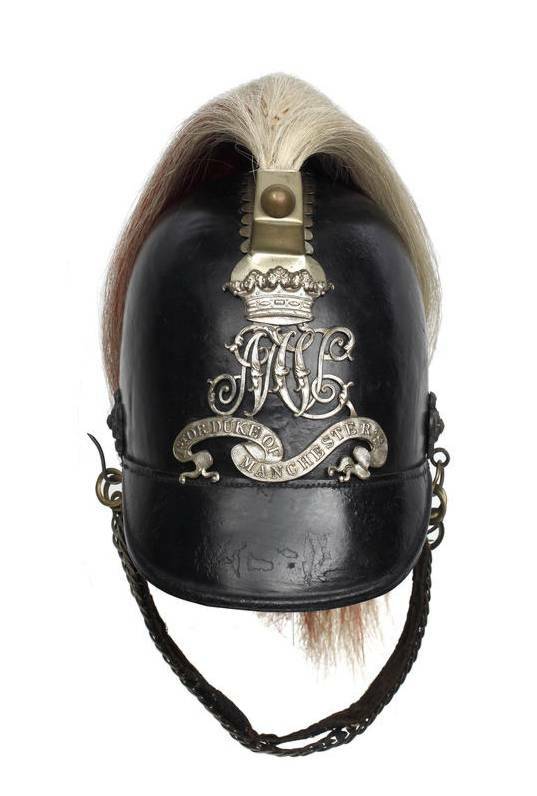 These for formed by the Duke of Manchester in 1861. Unlike his brother William stayed on living here with the veterinary business and died here on 15th July 1895. Unsurprisingly the business at this location was known as William & Richard Barrow, veterinary surgeons. Shown below is a newspaper advert that ran in May 1857 in 'Bells Life in London and Sporting Chronicle'. BARROW'S GOLDEN OINTMENT of IODINE, patronised by the principal racing and hunting establishments in the kingdom, as a speedy cure for curbs, spavins, splints, strained sinews and ligaments, & c; can be applied during work. Prepared only and sold by William and Richard Barrow, veterinary surgeons, Newmarket; and may be had of Henry Stevens (late Coleby), 112, Cheapside; Hannay, 63, Oxford-street, London; John Ross, Medical Hall, Kelso; Thomas Johnson, 37, Grafton-street, Dublin: and all other respectable chemists, in boxes at 2s 6d, 4s 6d, and 7s, with full directions, and sent post free; where also may be had BARROW'S celebrated GUM PLASTER, for strained sinews and ligaments, in pots 5s and 10s each. Richard's son George Barrow also became a veterinary surgeon. He married Elizabeth Rayner on 5th Apr 1877 at Newmarket St Mary's and in 1881 can be seen living at Marlborough, Wiltshire. Ten years later in 1891 he was back in Newmarket living at what had become Marlborough House in Upper Station Road (now Old Station Road). 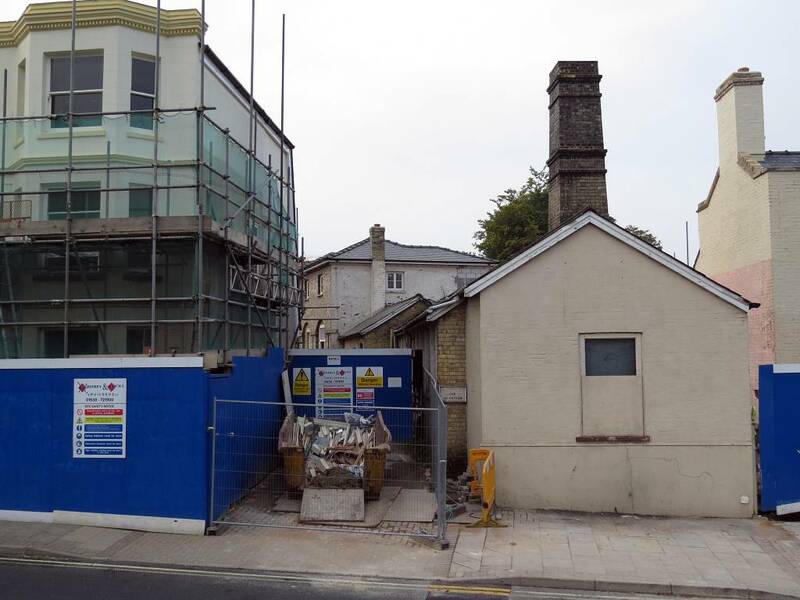 Marlborough House stables is still present next to Rous Memorial Court at the corner of Old Station and Vicarage Road. George died on 21st February 1911 at Savernake House, Newmarket. William and Richard's father (as detailed above another William Barrow) died in 1836 and details in his will show that he was also a veterinary surgeon, a farrier and a shoeing smith (hence presumably the reason for there being a smithy on this site). As mentioned above Joseph Rogers was an executor of this will, as also was Charles Bottom (of the Jockey Club and White Hart Hotel fame). William Cripps Kitchener and Ebenezer Feist of Messrs. Weatherby & Kitchener Solicitors were the witnesses to the will, proved on 14th May 1836. Frank was born in Cambridge in 1868, the son of William and Elizabeth Potts. His father was a master brewer. He didn't stay long living here though; only being listed on the 1901 census at this location - by 1911 he was at No.2 Denson Terrace, Rous Road - still a veterinary surgeon. In Kelly's 1916 directory he's listed as an M.R.C.V.S. veterinary surgeon at Wallis House - No.190 High Street. In the 1909-1912 Phone Books not only is he listed as a veterinary surgeon at No.2 Denson Terrace, but also at 'The Queensbury' [?]. He died in Newmarket on 17th March 1922 and is buried in Mill Road cemetery, Cambridge. Living next door to Frank Potts in 1901 was another veterinary surgeon William Smith, born in Hilgay, Norfolk in 1856. By the 1911 census he's given his full name of William Frank Smith, widowed by that time and for the first time the houses along here were given a name - he lived in Burchley House. In Kelly's 1916 directory William Frank Smith lived in Hurricana House - this is the house next to Alicia House (see 1925 details for Brayley Reynolds below). 1911 brought another new and slightly better well known veterinary surgeon to this location - William Edward Livock. William was born in 1860 in West Derby, Liverpool in Lancashire and baptised at Wavertree Holy Trinity on 15th July 1860. The son of Edward and Maria Livock, his father was a horse manager at a railway station. William married Mabel Charlotte Saich on 21st November 1896 at Hersham, St Peter in Surrey. William graduated in Edinburgh. He retired in 1926 and lived at and managed the racecourse stables at the Links. He did get to travel though as on 9th February 1928 he arrived at London on the Blue Star Line's ship Avelona from Buenos Aires, Argentina. Ernest Brayley Reynolds, known mostly as Brayley Reynolds, was born in Daventry, Northamptonshire in 1879. The son of James Henry Reynolds (another veterinary surgeon) and Charlotte Anne (née Sharman) he was baptised at Daventry on 20th August 1879. Brayley joined the veterinary practice here in 1923 and in Kelly's 1925 directory can be seen living at Alicia House, High Street (which at that time was just to the left of what is now Heath Garage). Following Livock's departure Geoff Leader joined with Brayley, as did a 21yo, recently qualified, Robert 'Bob' Crowhurst in 1937. Bob subsequently joined the Royal Veterinary Corp in 1940, returning to the practice in 1946. Also following WWII, Reg Day's son Frederic 'Fred' Thomas Day joined them. Details about the Day dynasty can be found on the pages for Bridlemere - where young Fred lived from 1946-1959, Terrace House - No.125 High Street - where his father Reg lived, and Lowther House - No.146 High Street - where his grandfather, another Fred Day lived. Brayley Reynolds retired in 1950 and died in Newmarket on 2nd March 1967. His impact on both this veterinary practice and veterinary services in general was significant and March House was renamed in his honour as Reynolds House. Peter Rossdale joined as an assistant in 1954, but left a few years later in 1959 to set up his own veterinary practice - details about which can be found on the page for Beaufort House - No.136-142 High Street. Donald J. Simpson graduated from the Royal Veterinary College in 1960 and joined the practice in 1962. He began his association with the National Stud after it moved to Newmarket in 1963. During his tenure the stud was home to leading sires Blakeney, Tudor Melody and, most notably, Mill Reef. 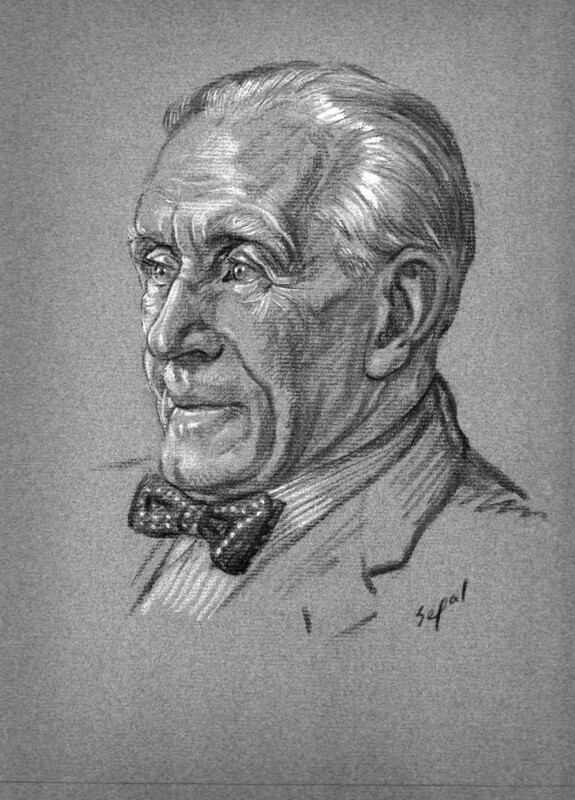 Donald lived at Heath Cottage and the Thatched House on the National Stud. He died in Newmarket as recently as 1st March 2010. Irishman Robin McEnery joined the practice for a few short years between 1964 and 1974 and left to become a full-time bloodstock agent. Two of the mainstays of the business joined in the mid-seventies - Richard E.S. Greenwood and David Richard Ellis (BVetMed DEO, FRCVS). David was born in 1944. He graduated from the Royal Veterinary College in 1967 and following two years practice in Hampshire moved to Newmarket. The final of the four 1986 partners; James Sydney Crowhurst (VetMB BA MRCVS) was born in Newmarket in 1953. He graduated in 1978 from the School of Veterinary Medicine, University of Cambridge. He joined Greenwood Ellis & Partners in 1981 and became a partner in 1984. He owns Crockford's Stud on the Woodditton Road. In 1983 the veterinary partnership purchased next-door Burchley House to expand the laboratory facilities. 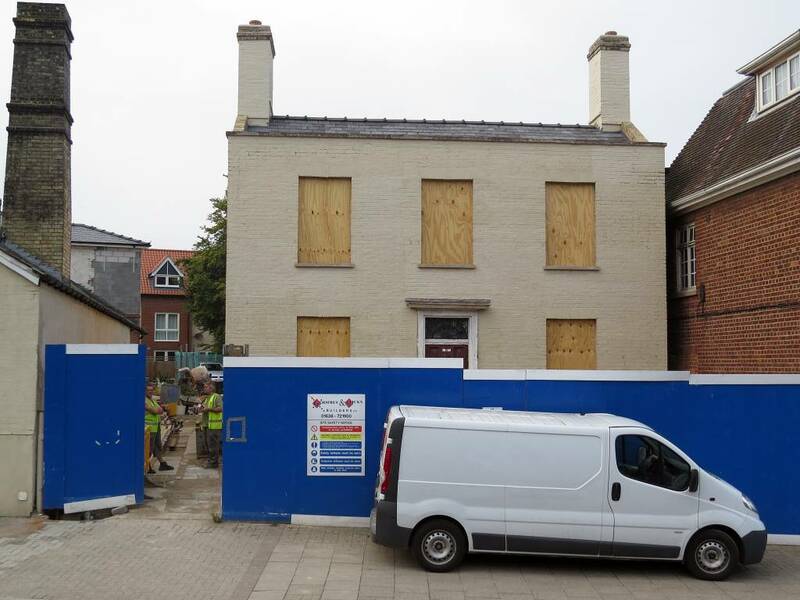 In June 2004 Greenwood, Ellis and Partners wanted to move their practice to the Kremlin Stud on the Fordham Road in Newmarket, but their planning application was refused by the FHDC. Four years later in 2008 the business started building their new Newmarket Equine Hospital at the Stetchworth Toll roundabout and the site here was put up for re-development.